Lookers in Real Estate seemed to fall online during the month of March. Still, there was an increase in closings for that month, relative to previous years. It’s good to keep in mind that homes typically go under contract a month or two in advance of closing. This means winter buyers increased as well. Many homeowners and some brokers feel that winters are slow. It is true that there are less people up here, but real estate sales continue year round. We can see from this chart that home sales show their lowest point around January and tend to increase from there. One needs to keep in mind that the chart reflects about a 2 month lag from the time a home goes under contract until it closes. This would be correct in that there seems to be less offers on homes near the holidays (Oct – Dec). In January, buyers begin their process again. Contracts are written and closings begin to increase in February and March. From that one can see how important it is to have their home listed during the winter months. If you’re not on the market, you’re not being seen and offers won’t be made for your home. 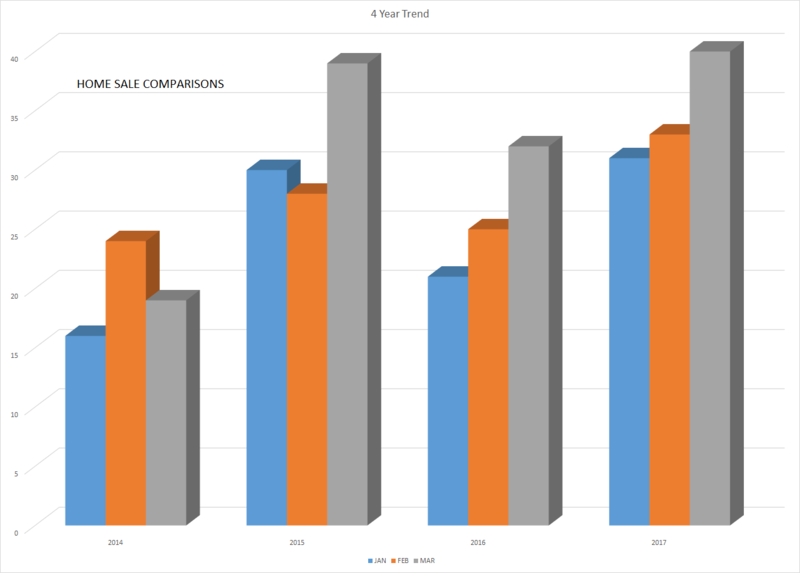 Average Unit Sales per Month/1 Year Average: 51 This number has been increasing ever slightly. It would tend to show some gain in market sales. YOY Inventory: 19 months – This is still a very high inventory. This causes prices to be held low. Some neighboring markets have very little inventory. However, the Highlands-Cashiers real estate market is unlike most any other market and can not be compared to neighboring markets. Average DOM: 413 This is typical for this area as we have a short selling season. DOM is not a reflection of the property in this market as it may be in others. Median Sales Price: $209,000 This was a real shocker. We had been hovering over the $300,000 mark for several months. This would tend to indicate there were more lower priced homes sold in March as compared with previous months. Remember, this is not “average” but “Median”. Average List/Sell Ratio: 91.49% – Relatively unchanged. It’s also an indicator that Buyers still see homes in this area as overpriced. Synopsis: In looking at the 4 year trend, it would seem that homes that may have been on the market for some time my stand a better opportunity to sell this year. Still, with high inventory, Sellers should not expect to get full price. Sellers should also consider that their home is priced correctly to lower substitution (competition). Land Units Sold: 17. Land sales began falling off further in 2014. This is the highest number of units sold in March since 2014. There seems to be more building activity. This could be the beginning of lands sales returning to the market. Inventory: 61 months. This is a very high inventory. Recent appraisals show land to hold low values. Synopsis: Land sales are improving. Construction seems to be on the rise. Still, land values are very low. Properties in Country Clubs or communities with great amenities may have higher value, but still below previous years. Many buyers are seeking unrestricted properties. 50% of home sales ranged from $200,000 to $499,999. 12.5% of home sales ranged from $500,000 – $749,999. 12.5% of home sales ranged from $750,000 – $1,000,000. 7.5% of sales were above $1,000,000. BUYERS: The increase in sales always gives Sellers a positive attitude on the market. As such, they may not be willing to negotiate as much. However, due to high DOM and the desire for some to sell, one may want to take advantage of this current climate. While one can not change location, they may be able to improve condition and/or price. Make sure your home is in it’s best condition to get top price. Make sure you are priced correctly.